DIF® Wallpaper Stripper removes the mess from removing wallpaper. The fast acting enzyme based formula is highly effective. It penetrates and loosens wallpaper making it easy to pull or scrape off. DIF® Wallpaper Stripper is the patented wallpaper stripper based on enzyme action for fast and easy..MORE removal of wallcoverings. With DIF® wallcoverings can be stripped quickly and reliably. DIF® is different from any other wallpaper remover solution on the market. 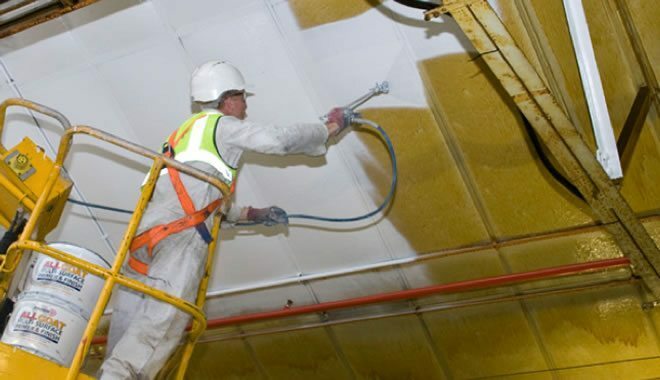 It is the only one that contains special enzymes - a unique, patented formulation with a superior, more effective blend of wetting agents that speeds penetration of the wallpaper and resolubilization of the paste. In contrast to DIF® Wallpaper Stripper, ordinary wallpaper remover solutions merely wet the paper and the paste, and therefore require a lot of scraping and do not work well except on loose sections. Softened paste tends to build up on the scraper blades, blunting them and leading to wall gouging. DIF® Wallpaper Stripper eliminated damage to walls caused by removal of uncoated, water-permeable wallpaper. 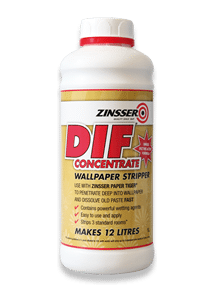 DIF® Wallpaper Stripper is the patented wallpaper stripper based on enzyme action for fast and easy removal of wallcoverings. Using DIF® Wallpaper Stripper is better than attempting to remove wallpaper with hot water, vinegar and water, or other home brew solutions. DIF® requires no steamers, so you do not have to bear the cost, mess, difficulty, or danger associated with the use of wallpaper steamers. Paper Tiger® features patented scoring wheels that perforate and dissolve the adhesive. Together with DIF® wallpaper solution there is no need for steamers.